We are one of the noteworthy enterprises engaged in offering superior quality AdorProcess Equipment. There is n-number of equipment that our professionals manufacture for the clients. 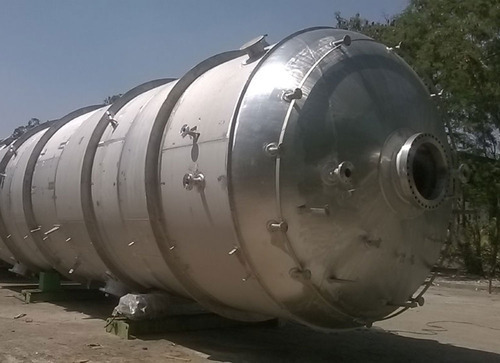 These few are process columns & towers, heat exchangers (shell / tube / finned types), dryers and regenerators, pressure vessels, separators, purifier vessels, and pressure swing absorbers. The offered equipment is manufactured using carbon steel – SA 515 / 516 Gr. 60 / 70, SA 537 Cl. 1 / 2, EN 10028-3 P275/P355 NL 1 / 2, IS 2041 and related material. We specialize in fabrication of carbon steels, low alloy chrome-moly steel in high temperature services, nickel bearing steel in cryogenic services, austenitic stainless steel in corrosive and oxidizing reducing environment , duplex stainless steel in corrosive and chloride rich fluids. We are 'U stamp', 'NB stamp' & 'R stamp' certified and approved vendors for Nuclear Power Corporation of India, Essar Projects, Tata Consulting Engineers, Linde-Global, NALCO, VATECH WABAG, HOERBIGER, KPCL, EIL, Toyo etc. We Ador Welding Limited, from 1951, are serving our customers by manufacturing, wholesaling and exporting a high-quality Welding Electrodes & Welding Equipments. Offered products range consists of SS Welding Electrodes, Welding Electrodes, and Flux Cored Welding Wires. We use latest technology, and machines while manufacturing these products. The product range offered by us is highly required by our clients for their simple design, fine finishing, and longer life. In addition to this, these products can customize according to the client’s requirements. Our provided products are highly demanded by various industrial such as Pipeline, Oil & Gas, Nuclear Energy and Defense Sector. Our organization is listed on Bombay Stock Exchange (BSE), Mumbai with Scrip Code 517041 and National Stock Exchange (NSE) with symbol "ADORWELD". To design the offered products as per the set industry guidelines, we have developed modern infrastructure facility at our premises. Our professionals are selected through industry approved selection procedures. Our team members maintain the product array in a well-categorized manner. Our team has the understanding of working with machines which are used in manufacturing and is capable of designing both standard and customized products. We arrange continuous training sessions that impart the relevant knowledge and skills to analyze the customer needs as well as stringent process demands. Moreover, we are offering these products at very affordable rates as per the needs and demands of our precious clients.